The Kiwi dollar was the top winner in Asia on Wednesday, surging 1.8% after the Reserve Bank of New Zealand kept interest rates unchanged, but following statement showed less dovish than expected tone, as central ban’s top officials pointed at balanced risks and unchanged risk of rate cut that unleashed bulls. 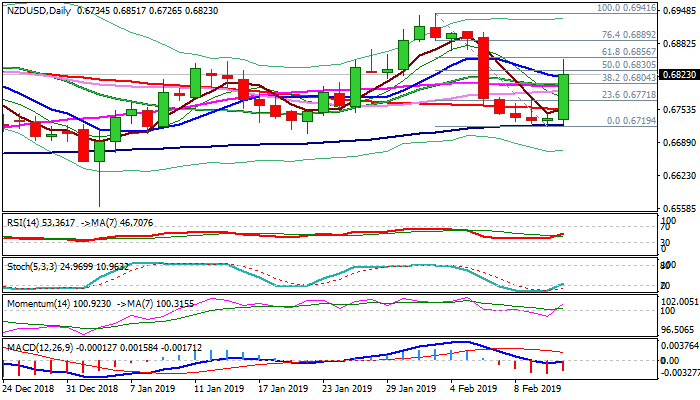 Traders took profits from 0.6941/0.6719 fall that was contained by rising 100SMA and strong bullish acceleration turned near-term outlook into positive mode, as stochastic reversed from oversold territory and north-heading momentum broke into positive zone. Rally faces headwinds from strong barriers at 0.6856/60 zone (Fibo 61.8% of 0.6941/0.6719 / base of falling weekly cloud) which may further obstruct bulls despite strong improvement in the sentiment. Corrective easing should be ideally contained by converged 20/55 SMA’s and broken Fibo 38.2% at 0.68 zone to keep bulls intact for fresh attempt higher. Sustained break above 0.6856/60 pivots would generate fresh bullish signal and open way for possible full retracement of 0.6941/0.6719 bear-leg. Conversely, return and close below 0.68 support zone would signal recovery stall and weaken near-term structure.